A happy thought struck me as I stood there ruining my nerves with a cigarette. Why not call the Twelfth Naval District and inquire after the Henderson. Perhaps she was in San Diego. I called and found my hunch correct. At two thirty, my trunk checked through to Diego, I was on a bus speeding southward once more. In San Diego, faint from lack of sleep and food, I requested transportation from Captain Adams of the Henderson. It was all right so far as he was concerned but it seemed that I needed an approval from Washington. In search of the approval, still tired and hungry, I called on the aide to the commandant. He was very pleasant and radioed immediately. With that attended to I rented a very cheap room and slept eighteen hours in a row. The morning of the next day saw a young redheaded fellow passing in and out of phone booths every few minutes. It was the thirtieth and the Henderson was sailing the morning of the first. I counted my scant change and decided on some hot cakes. They seemed the cheapest and the most filling. My message arrived the evening of the thirtieth and stated that my father’s permission was needed. It ordinarily took two days to get an answer from Guam and this was no exception. The radio from my Dad arrived the morning of the first, about an hour before the Henderson sailed. The evening of the thirtieth brought the sad news that my trunk was somewhere between Frisco and Diego, to be rescued a year later. 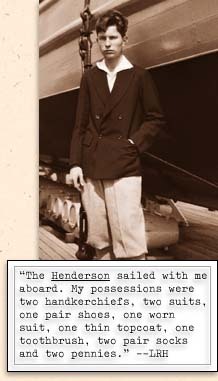 The Henderson sailed with me aboard. My possessions were two handkerchiefs, two suits, one pair shoes, one worn suit, one thin topcoat, one toothbrush, two pair socks and two pennies. No wardrobe, no money, but that trip was the best I ever took and the best I ever hope to take.